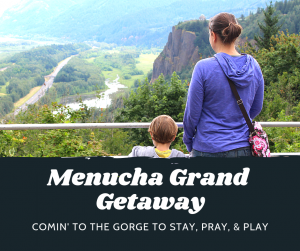 Come to the Gorge to pray, play, and sing the day away in an intergenerational camp environment. Kids of all ages along with their parents and/or grandparents are invited to come and join the fun. There will be daily song time, nature activities, games, worship, rest time, and even s’mores complete with the best view this side of Oregon! Escape the overscheduled world and spend a few days of camp together! Registration is open until June 9 (or when we fill). Join us! Each family/group will have their own room in Wright Hall based on number of attendees. Shared bathroom in room or down the hall.